With the recent explosion of artificial turf baseball and softball fields, one issue has really grabbed my attention. Warning Tracks! Warning tracks have been a part of baseball/softball for decades. They serve a critical purpose in warning players that they are approaching a permanent fixture of some kind. 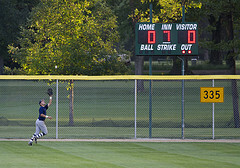 When players are focused on catching a fly ball, they are looking up at the ball, not down at the field. Fielders rely on a change of texture under foot to alert them that they are approaching immovable barriers along the perimeter of a playing field. 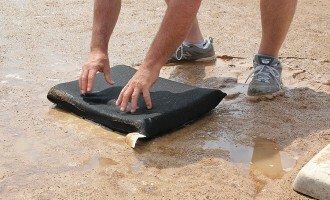 Artificial turf warning tracks don’t have a change of texture, only a change of color, which puts players at risk. 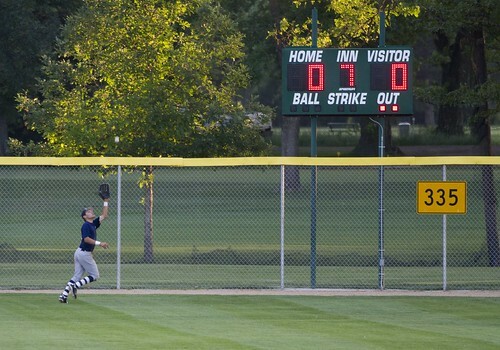 A player engrossed in catching a ball is rarely going to think about looking down to see the change of turf color that notifies them they are on the artificial turf warning track and rapidly approaching an obstacle. And therein lies the problem with the rapid proliferation of artificial turf ballfield. Pretty much all of the artificial turf fields delineate the position of the warning track by simply changing the color of the artificial turf. Unless a ballplayer is looking down when he approaches an obstacle, he will have no other way of be warned of the impending collision. If I was a college or high school athletic director, I would be pressuring the artificial turf manufactures for a better solution to warn fielders of these dangers. Ultimately, it comes down to those decision makers to look out for their player’s safety. 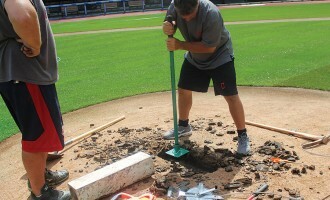 Warning tracks play a key role in the game and in the maintenance and upkeep of a ballfield. The standard rule of thumb for the width of a warning track is to provide a 3-step warning for a player who is running at full speed. This allows one step for the player to realize they are on a different textured surface and two additional steps to decelerate before impacting the solid object such as a fence. Since the age of a player is a fairly good indicator for length of stride at a full out run, use this chart for recommended outfield warning track widths per age group. 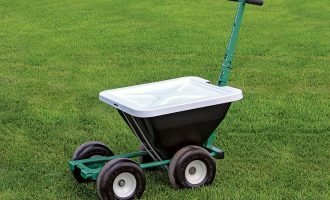 On natural grass fields, warning tracks not only provide a safety feature to the field but they also provide a marked roadway for maintenance vehicles to travel on instead of on the grass. The correct size/width warning track also allows the foot traffic that exits the dugouts to spread out before stepping foot on the grass thereby reducing turfgrass wear. Warning tracks also reduce or eliminate maintenance of vegetation along and against walls and fences on the perimeter of the field. For the sake of player safety, let’s hope that turf manufacturers/installers and athletic directors pay more attention to this issue and rectify it before too many more faux artificial turf warning tracks are installed.